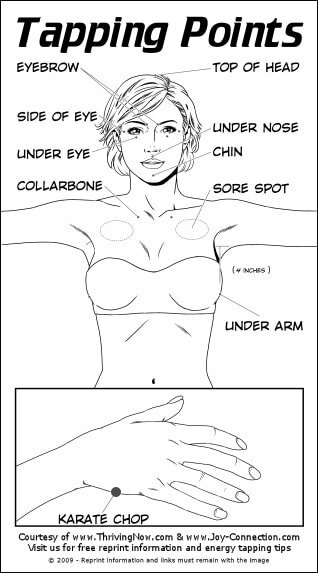 EFT ( Emotional Freedom Techniques) can be described as a mixture of acupressure and psychology. It is a very effective stress management tool. It has been effective for depression, anxiety, post traumatic stress disorder, various physical illnesses, fear of public speaking and even to enhance sports performance. Basics of EFT can be learned very quickly. ​ There are 10 points to tap on with our fingers while talking about an issue. Below are the points and short instructions. 1. Where in your body do you feel the emotional issue most strongly? 2. Determine the distress level in that place on your body on a scale from 0 to 10, where 10 is maximum intensity and 0 is no intensity. ''Even though I have ________ (name the problem) , I deeply and completely accept myself." 4. The Tapping Sequence: Tap about 7 times on each of the energy points shown on the picture, while repeating a brief phase that reminds you of your problem. 5. Determine your distress level again on a scale of 0 to 10 and where do you feel it most strongly in your body. If it is still high, say 3 times while tapping on the karate chop point. 6. Go to step 4 and back to 5. Repeat the tapping sequence as much as needed until you bring intensity as close as possible to 0. Note: Meridians run parallel in our body therefore it does not matter what side you are tapping on. Very important to stay hydrated through the process and be as specific as possible about your problem.